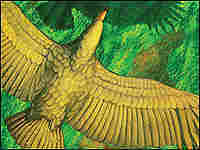 Giant Bird Could Have Flown at 150 MPH Over two decades ago, the fossilized remains of a giant bird were found. Now, a new study suggests that this 6 million-year- old bird from Argentina — the Argentavis magnificens — could actually fly at speeds of up to 150 mph. 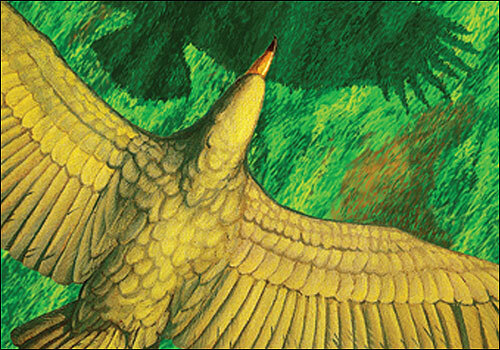 New research suggests that the giant bird, which lived in Argentina 6 million years ago, could dive at speeds of up to 150 mph. 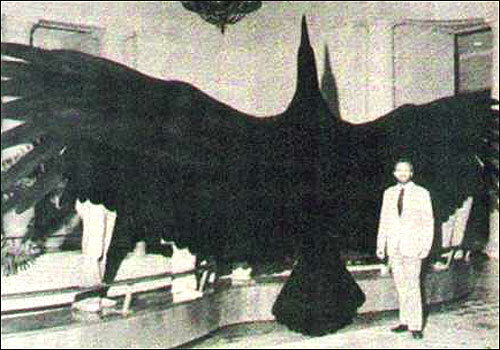 Kenneth Campbell, now curator of birds at the Natural History Museum of Los Angeles County, stands with a cut-out of the fossilized bird he found in 1980. Imagine a bald eagle with wings that stretch for 21 feet from tip to tip and feathers the size of Samurai swords. Give your giant bird a big, hooked beak designed to snap the necks of living prey. Give it a body four times heavier than the body of the largest flying bird alive today. The bird you are now thinking of is known to scientists as Argentavis magnificens. It lived in Argentina six million years ago. For decades, ornithologists have fought over whether this monstrous bird was capable of flying. But that argument seems to be over now, thanks to a paper in the Proceedings of the National Academy of Sciences. Using software originally written for helicopters, the authors of this paper concluded not only that the argentavis soared on the winds, but that it sometimes flew at up to 150 miles per hour. "Mythological versions of giant soaring birds appear in religions all over the world," says lead author Sankar Chatergee of Texas Tech University. 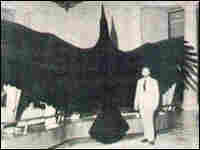 "What we have done is shown that it would have been possible for a so-called monster bird to fly." Chatergee and his colleagues say there are a few things they still don't understand about this bird, though. For example, they're not sure how this giant bird was capable to taking off and landing. Adam Summers, an expert on biomechanics at the University of California at Irvine, says that in today's world, the heaviest living flying birds weigh no more 40 pounds. But Chatergee's calculations say the monster eagles were capable of diving at 150 miles per hour. Summers says the roar of the wind whipping through the five-foot flight feathers on the bird's wings would probably have echoed for miles.